From 2007 the Foundation organized a lot of events and masterclass, the latest are courses and masterclasses in Italy and Belgrade in May 2013. In June 2013 a course was held with world renowned pianist and accompanist Richard Barker and Darina Takova in Sofia. 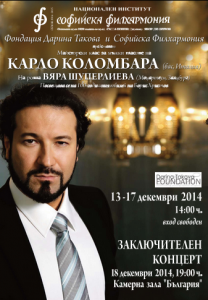 The last masterclass of the year 2013 was held at the National Palace of Culture NDK in Sofia as part of the “Verdi and Wagner, 200 years of inspiration” project. 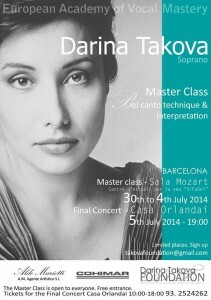 In 2014 the Darina Takova Foundation made a masterclass dedicated to Belcanto in Barcelona and masterclass in the Summer Art Academy of Sozopol. In December 2014 was the masterclass of the Italian bass Carlo Colombara.